Just lots and lots of caves in the Soapstone area. Most are simple sink holes that open up to one large room. Not much to explore, but lots of fun getting in and out. 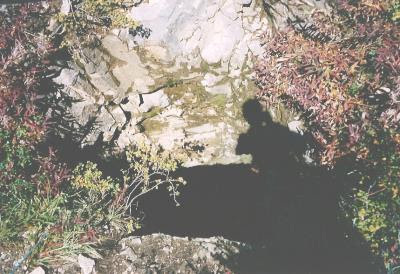 George Thompson shows a picture of this cave in his book "Faded Footprints". The entrance has an arch down the center that makes it look like a pair of owl eyes. The rappel is about 30' to a sloped landing which then drops another 40' into a large room with a few small passages. 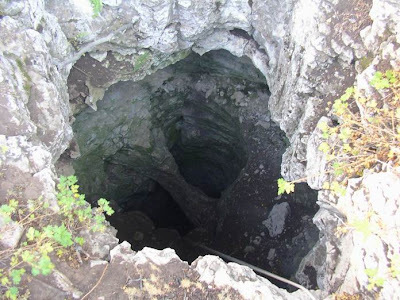 Owl Cave is known to be the second largest cave in the Soapstone Basin at 283 feet. This is just one of many sinks across the plateau that have no sign of treasure or any mineral deposits at all. Looking up out of the "Owl Hole". This one is the only cave in that area with a history connecting to Spanish treasure. 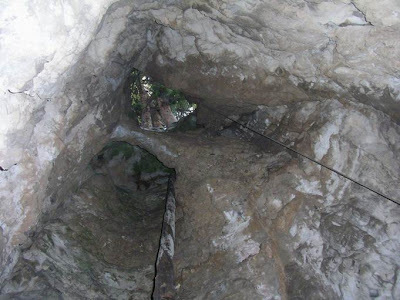 The first person to explore it stated that they found a gold bar at the bottom amidst the boulders. No evidence has been brought forward to prove the story as true. 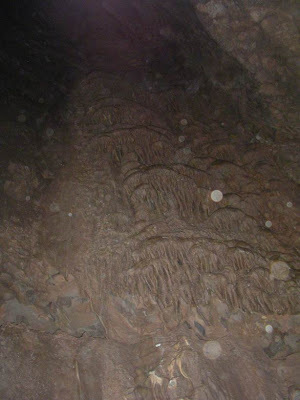 Gold Bar Cave is probably the shollowest cave in the Soapstone Basin area at only 27 ft deep and 125 feet long. It is fairly unstable inside with a lot of loose boulders and debris. Columbine Pit is a 40' drop to a sloping tunnel that dead ends about 30' back. Columbine is located at the back of a large meadow. It can be seen from the road near the cliffs overlooking Iron Mine Creek. Stink Pit does not really stink, but apparently did when it was named. The entrance is down climbable and then opens up to a 30' dia. x30' high room. A crawl leads to a 20' dia. room than is barely tall enough to crawl through, but has some beautiful swirling patterns throughout the rock. 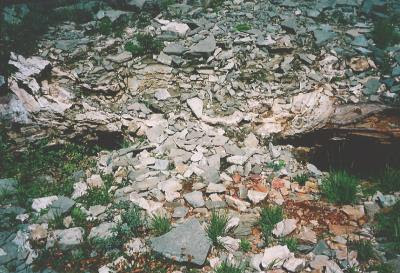 This is another Soapstone Basin cave. Pyrite Pit is one of my all time favorite verts in the state. The shoulder width hole opens up a few feet in and drops into a round room about 30' down. In the center of that room is a 4' hole that drops another 50' into an eye shaped pit. The cave recieved its name from the gold looking water droplets that form in the first room. Pine Pole Pit is one of the many Cold Springs caves. This one is about 30' vertical and opens up to a 15' x 20' room. 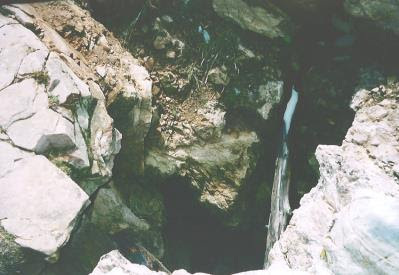 Grave Cave is a typical Soapstone Basin sink hole. It is a 30 foot incline to a 10 foot drop into a large 20'x30' room. It got its name because someone had built a dirt mound with a cross in it to represent a grave just inside the entrance. I have also heard stories of a mummy being found in here as well. 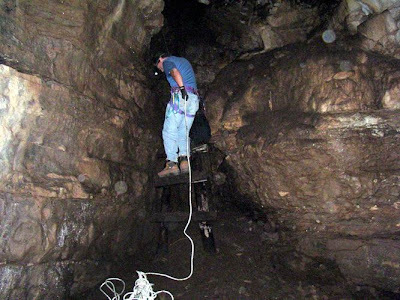 There are a few old ladders in Grave Cave, but a rope is suggested for safety sake. Hatari is the largest of the caves in the Soapstone Basin area. It has over 500 feet of passage, with potential for more. 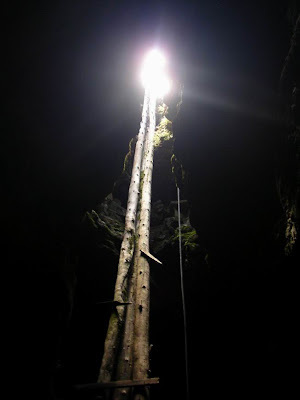 It has 3 pitches, with the longest pitch up to 150 feet. Moonmilk and dripstone can be found in the cave. 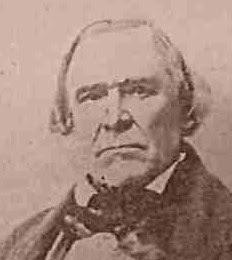 These two prospects are located close to Stink Pit. Both would require a bit of digging to re-open.